Initially matured in American Bourbon barrels, this Speyside single malt was additionally finished in Jamacian Dark Rum casks. A limited release which is packed full of flavour, hints of stewed apples, ginger and barley can be detected. Taste Ripe yellow plums and nectarines infused with vanilla, ginger and tangerine peel. Wild flower honey combined with stewed barley creates an exceptionally luscious and long finish. Nose Vanilla syrup and poached pears, dusted with sweet barley grist, combine with oak spice and candied peel to create a warm contrast. 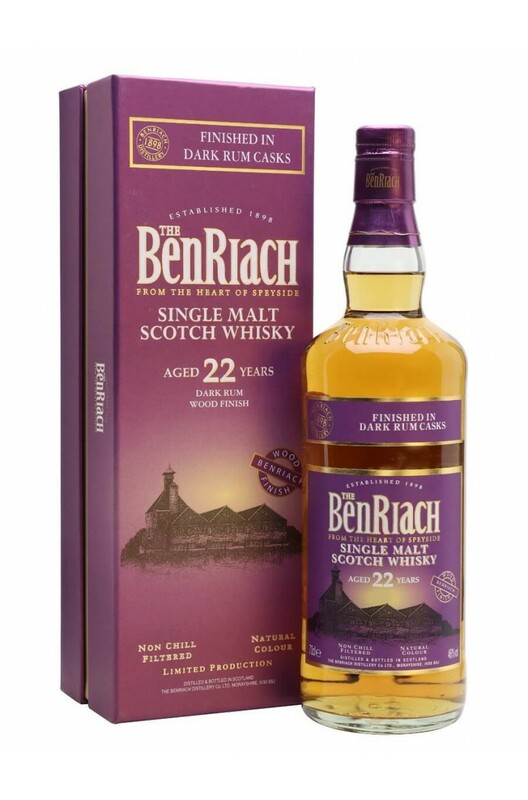 Finish The rich, dark sugars and warm oak spice of the dark rum casks combine perfectly with orchard fruits and fresh barley character of the classic BenRiach style. A truly exceptional example of the marriage between cask maturation and spirit.